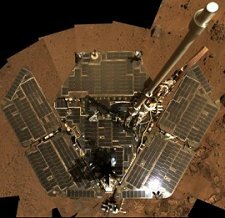 July 20, 2007: Having explored Mars for three-and-a-half years in what were missions originally designed for three months, NASA's Mars rovers Spirit and Opportunity are facing perhaps their biggest challenge. For nearly a month, a series of severe Martian summer dust storms has affected the rover Opportunity and, to a lesser extent, its twin, Spirit. The dust in the Martian atmosphere over Opportunity has blocked 99 percent of direct sunlight to the rover, leaving only the limited diffuse sky light to power it. Scientists fear the storms might continue for several days, if not weeks. "We're rooting for our rovers to survive these storms, but they were never designed for conditions this intense," says Alan Stern, associate administrator of NASA's Science Mission Directorate, Washington. If the sunlight is further cut back for an extended period, the rovers will not be able to generate enough power to keep themselves warm or operate at all, even in a near-dormant state. The problem is, Mars is a very cold planet, and the rovers depend on electric heaters to keep some of their vital core electronics warm. Before the dust storms began blocking sunlight last month, Opportunity's solar panels had been producing about 700 watt hours of electricity per day, enough to light a 100-watt bulb for seven hours. When dust in the air reduced the panels' daily output to less than 400 watt hours, the rover team suspended driving and most observations, including use of the robotic arm, cameras and spectrometers to study the site where Opportunity is located. On Tuesday, July 17, the output from Opportunity's solar panels dropped to 148 watt hours, the lowest point for either rover. On Wednesday, Opportunity's solar-panel output dropped even lower, to 128 watt hours. NASA engineers are taking proactive measures to protect the rovers, especially Opportunity, which is experiencing the brunt of the dust storm. The rovers are showing robust survival characteristics. Spirit, in a location where the storm is currently less severe, has been instructed to conserve battery power by limiting its activities. "We are taking more aggressive action with both rovers than we needed before," said John Callas, project manager for the twin rovers at the Jet Propulsion Laboratory, Pasadena, Calif.
By Opportunity's 1,236th Martian day, which ended Tuesday, driving and all science observations had already been suspended. The rover still used more energy than its solar panels could generate on that day, drawing down its battery. "The only thing left to cut were some of the communication sessions," Callas said. To minimize further the amount of energy Opportunity is using, mission controllers sent commands on Wednesday, July 18, instructing the rover to refrain from communicating with Earth on Thursday and Friday. This is the first time either of the rovers has been told to skip communications for a day or more in order to conserve energy. Engineers calculate that skipping communications sessions should lower daily energy use to less than 130 watt hours. A possible outcome of this storm is that one or both rovers could be damaged permanently or even disabled. Engineers will assess the capability of each rover after the storm clears. NASA will provide mission updates as events warrant. The Jet Propulsion Laboratory manages the Mars Exploration Rover project for NASA's Science Mission Directorate.